This past Sunday, I knew I was having our friends over for the football game but couldn't decide what my contribution to the evening would be. Todd had decided to make my favorite chicken wings, (which I will post soon) but I felt a little over-whelmed with all of my recent recipe finds. I have found a TON of inspiration lately in this underground world of food blogging yet I couldn't nail down what I was craving or willing to try that day. Our friend Kim had come over to help install a new screen door on the back of the house and I started to think, "What would he like?" Before I could even finish my own thought, deviled eggs came to mind. He would want deviled eggs. He loves deviled eggs. I immediately started to sift through the "food files" and I came across this one. I was sold. 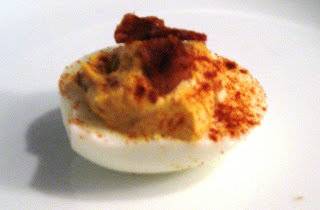 Now I know what you may be thinking... deviled eggs are a classic, why mess with them? I will tell you why... because it has bacon, that's why. Seriously, who doesn't like bacon? Place eggs in pan and cover with water. Bring to boil, turn off burner, cover and leave them alone for exactly 13 minutes. After 13 minutes, drain hot water and immediately submerge your eggs into cold water. Crack open, remove shell, and cut eggs in half. Place egg whites on a serving platter. Place egg yolks into small bowl and mash. Add in mayonnaise, mustard, vinegar, chipotle chile powder, and garlic powder. Mix with an electric mixer until smooth. Stir in 4 pieces of chopped bacon, reserving 2 pieces to garnish the top of the eggs. Place mixture into pastry bag and fill each egg white half, dividing the mixture as evenly as possible between the eggs. Sprinkle eggs with smoked paprika and garnish with bacon pieces. I made these on the fly an hour before the game and no one was disappointed. Clean-up was a cinch; it entailed putting an empty plate in the dishwasher! That, to me, is when I know I found a keeper! The Little Bitchin Kitchen is here for every one of your party needs! Call or e-mail for a quote! Everything about this sounds amazing. Seriously amazing.